Everyone I’ve ever met, in one way or another, has a colorful past. By this, I mean that I’ve learned that almost everyone has something unexpected and interesting about them, and particularly about their past, which the majority of us would perhaps not know just from meeting them, or even interacting with them in an ordinary acquaintance-type relationship on an ordinary day. Unfortunately, for many people in my generation, memories — photographs — saved from those days are often colorless. And fragile. They age, just as we do. You see, when I was a kid, we didn’t have digital photography. Because of this, any images from our childhoods — and don’t even ask about the childhoods of our parents, or grandparents! — suffer at least two indignities as time passes. First, in many instances, we didn’t even have color photography; for a lot of us, it was a black-and-white world. Secondly, digital photographs, for the most part, don’t “age” like photographs of old. Sure, digital photos can “age” — I haven’t seen this in awhile, but I remember the earlier days of working with digital images, where suddenly, half an image I hadn’t looked at in awhile would show up as obliterated. There might be a grayish-brown section, looking like someone had made a cut-out in front of part of the image. Sometimes, I would see colorful jpg artifacts that hadn’t been there before. In most of those cases, the culprit was the medium on which the image had been stored, just as for the prints of old, where the paper, or chemicals, began to break down. Old-time printed images don’t perhaps suffer the same indignities of the modern digital file, but the indignities they suffer, they suffer with more regularity. In my experience, it’s not at all unusual to see old images that contain numerous scratches, or dust particles from a bad print. Less common, but not uncommon, is to see an image with a spill, or cat vomit that was less-than-successfully removed. Sometimes this is because whatever was spilled had dried in place. The first image I ever tried to restore was one taken of my father when he was about 17 years old. As you can see, it suffers from a couple of age-related deficiencies. The formerly black-and-white image has yellowed a bit. Oddly, there are some areas of pure white on the print, which I’d previously assumed was because the negative itself had yellowed, but because of dust specks on it had left white spots on the paper. But when I printed black-and-white images as a youngster, we used a different kind of paper which, even if we’d tried to print a color negative onto it, would only have presented gray tones (thus, would only be varying tones of black or white). So I really don’t see how the yellowish tone could be the negative; it must be the silvers in the image fading, and the white stays white because there was nothing there to fade. Some of the stuff on the print was deposited there after it was printed, but the white specks were probably dust, or other junk, on the negative, or the enlarger. In addition, the tree branches closer to the top of the print have begun to fade. My most attempt at restoration was less restoring, and more coloring. This is some few months after the image of my father was done. In between, I restored a few other images, about which I’ll write another time. 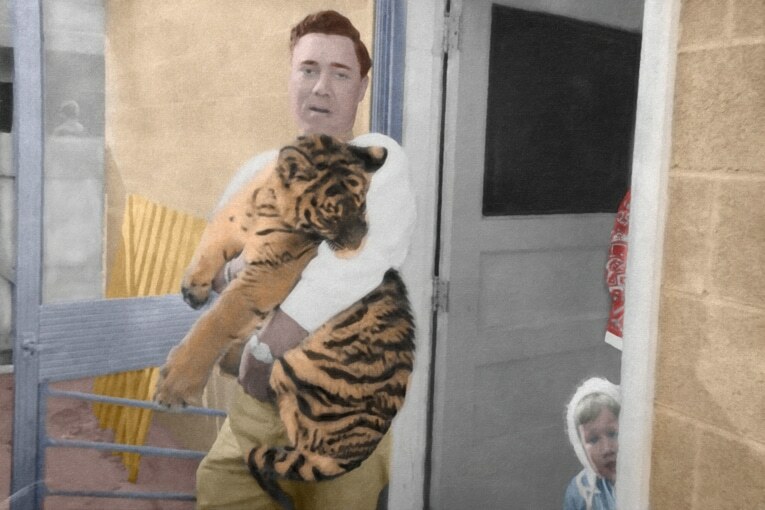 This most recent attempt was with a picture of my wife’s father, a tiger cub, and my wife as a small child. My wife’s dad was “Doc” Chaffee, about whom I’ve written elsewhere. (I am happy to report the Zoo is doing much better these days.) Yes, the final product is the image at the top of this post. But I started with a small black-and-white print, approximately 3.5 by 5 inches. I scanned it at 600 dpi — probably a much higher resolution than necessary, but I wanted as much detail as possible. It’s perhaps difficult to see in the resolution posted here — in future posts, I’m going to see about posting and linking full-resolution images to the images in the post — but there was a bit of cleaning up to do. The print was dirty, had a couple of hairs and things like that on it. When I restore a photo like this, I typically start by duplicating the original layer, then cleaning all the defects to get a clean “original.” Then I duplicate that layer so regardless of any other “destructive” work — i.e., work that changes pixels in a layer — that I might do, I can always go back to the clean “original,” if I want. As you can see, this image was not a true black-and-white image; it has a little bit (but not quite) of a sepia quality to it. So first I ran a black-and-white filter (separate layer! ), and a curves layer (again, separate! ), to get a true black-and-white. Next, to bring out more definition, I ran a “high pass” filter, and set that layer to “Overlay” blend mode (“Soft Light” would work, also, but “Overlay” gives more contrast, and thus more definition, which I needed here). After that, it was largely a matter of creating various layers to layer in the colors. Sometimes, I will just paint the color right into the area that I want. But I’ve found that it’s often better to just fill an entire layer with the color that I want, then mask it in or out as necessary. Among other things, this makes it easier to see the layers I might want if I have to go back to them; if I’m looking for lips, then a layer filled with black isn’t it. And since you will have set the blend mode to “Color,” painting on the mask makes it easier to see what you’re coloring. Another thing about adding colors that really helped me on the tiger picture: I started downloading “reference images” and inserting them right into the Photoshop file as separate layers. I had one for skin tones, for example. When I needed a skin tone, I turned on the layer, sampled the color, then turned off the layer again. At that point, I had a skin tone that was close to what I was looking for, without having to remember the RGB values, or any other codes, myself. Similarly, for the tiger I downloaded a reference image of a tiger, then sampled colors from it to paint the tiger in my image. These can be kept in the file, and turned on, or off, as needed; or you can delete them when you’re sure you’re done with them. After all the coloring was done, I created a new layer that incorporated all the changes to that point, using Shift-Cmd-Option-e on my Mac. Then I added some 50% gray layers set to either Overlay or Soft Light blend modes, and painted on them with black, or white, to dodge and burn. This works so much better than the dodge and burn tool in Photoshop. I get a much greater level of control, and I can fade the layer in and out if I think I went too far. It’s for this reason that I also use multiple layers of this type — there might be one for working on a door, another for a hand, a third for a face, etc. As a final step — and really this was something I kept in mind while processing each layer, because I already knew I would do this — I tried to make the photo look more like a painting. One “trick” I’ve found in working with some older photos like this is that if I deliberately make them look more like paintings than photographs, any deficiencies that a restoration can’t really fix (like blurriness of the original image) are subsumed into the painterly effect; they no longer look like defects, but the imperfections make it look even more like a painting. One of these days, maybe I’ll be able to make things more realistic, like these colorized images, but for now, that’s how I work it. Ultimately, the image of my wife, her dad, and the tiger needed about 54 layers to complete. Because I’d scanned the image at such a high resolution, I was able to print it on a 16 by 24 giclée stretched canvas. It looks good. So good, in fact, that we’re printing smaller canvases to put in our respective offices! Next Next post: Don’t Feed the Dino!